Roaring into the Summer with Wikki Stix Dinosaur Activities for Preschool! Preschoolers are fascinated by DINOSAURS! This summer, help encourage playful learning with Wikki Stix Dinosaur Activities designed just for preschool! How do we know that Dinosaurs once lived on our Earth? Scientists have discovered fossils that tell us dinosaurs once lived on our Earth. Explain to the children that fossils are parts of a plant or animal (dinosaur) that are found in rocks or in the ground. Read the book “What Happened to the Dinosaurs” by B. Most. There are no more dinosaurs left on our Earth because they are EXTINCT (ALL GONE)! Expand on the concept of extinct by asking the following questions. Would a real dinosaur come to your house or to school? Why not? Would a real dinosaur show up at the mall or the grocery store? Why not? How big were the dinosaurs? Some dinosaurs were bigger than a HOUSE! What did dinosaurs EAT? Some dinosaurs liked to eat MEAT (other animals or smaller/weaker dinosaurs) and some dinosaurs ate only PLANTS. Help the children make a list of the kinds of dinosaurs that were plant-eaters and those that were meat-eaters. He’s HUGE, He’s STRONG, he won’t be HUNGRY very long. Dino Ditty, Ditty Dum, Ditty Dum, HEY! Materials needed: Super Wikki Stix (best for this activity, but standard Wikki Stix can be used), scissors, and an assortment of large and small toy dinosaurs. Set out the dinosaurs on the floor and have the children sort them by height and length. Which dinosaur is taller, smaller, shorter, or longer? Older children can cut Super Wikki Stix strands that are the length or height of the dinosaurs being used. Younger children may need help in cutting the Wikki Stix at the appropriate lengths. This activity is also a great way for younger and older children to work together in order to complete a task. Who is going to hold the Wikki Stix? Who is going to cut the Wikki Stix? Extension Activity #1: Make a display board with the strings of various sizes to reinforce the concepts of small/large and/or short and long. Extension Activity #2: Use regular 4 regular Wikki Stix strands. Cut each strand into four equal sections (fold the Wikki Stix in half and cut two sections – repeat). 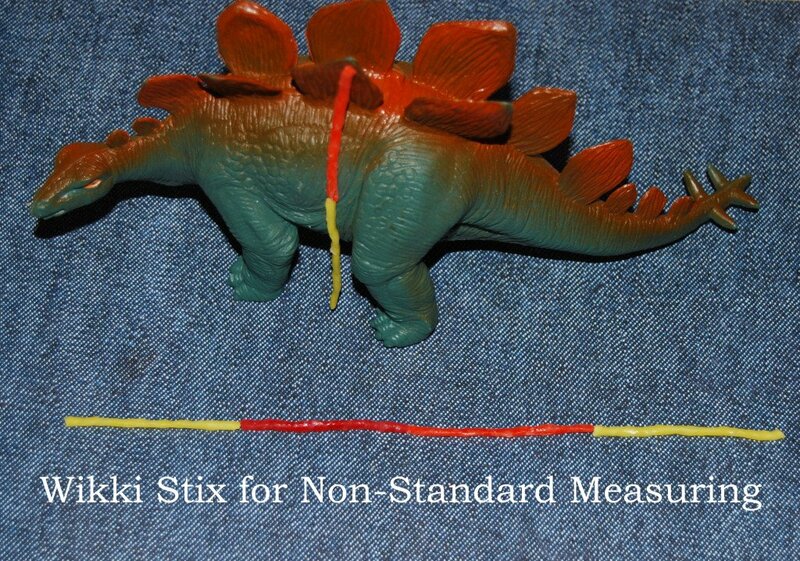 Invite the children to use the Wikki Stix pieces for non-standard measuring practice. How many pieces of Wikki Stix will it take to measure the length of the dinosaur? How many pieces of Wikki Stix to measure how tall the dinosaur is? If desired, record how long/tall each of the dinosaurs are on a separate sheet of paper. Materials needed: Two dice (limit to one die for younger children), one game file (linked above) per child, and green, purple, red, and blue Wikki Stix (pre-cut in half and set aside). To reuse the game: laminate the game file or cover with clear contact paper. 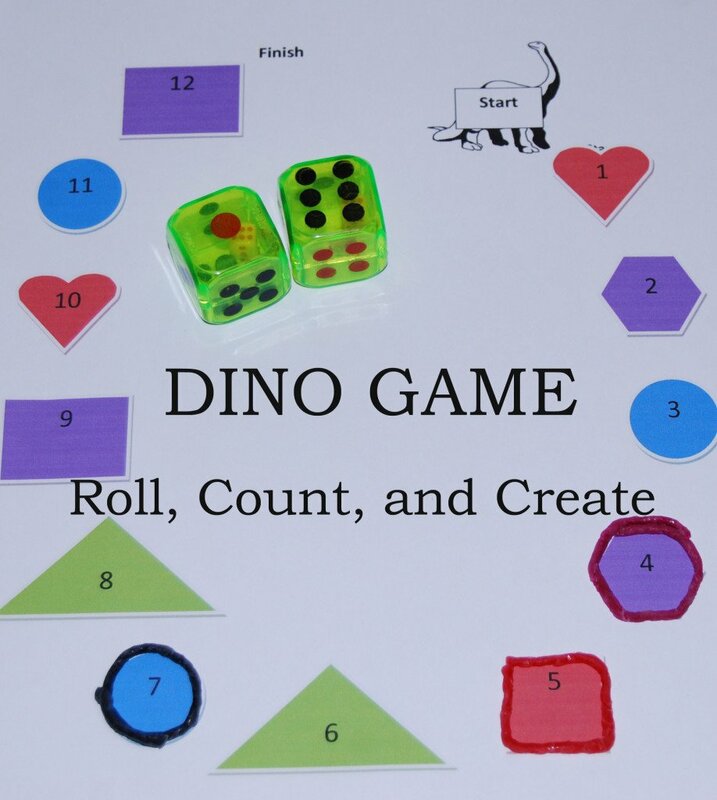 Have the children roll two dice, count the number of dots, and find that number on the game board. The children should say the name of the shape indicated by the number on the board and then CREATE the shape with Wikki Stix to cover that number. The game is over when all the shapes have been created with Wikki Stix. Note: If using two dice, the number ONE will not be covered. For younger children: Only use one die and focus on only the numbers 1-6 and the corresponding shapes. Alternate Suggestion: Focus on only ODD or EVEN numbers and have the children create only the shapes that correspond to the ODD rolls or the EVEN rolls. To make the DIY rubbing plates: have the children trace around a toy dinosaur foot with Wikki Stix (or create their own version of a dinosaur’s footprint) on a blank sheet of paper. Invite the children to lay another sheet of paper over the Wikki Stix created dinosaur footprints and rub across the sheet with a crayon (take the paper off of a crayon and demonstrate for the children how to make a rubbing by laying the crayon flat against the paper). Note: if the paper tends to slide, put both sheets on a clipboard to make it easier for the children. Young children think it is almost “magical” to watch the image appear. 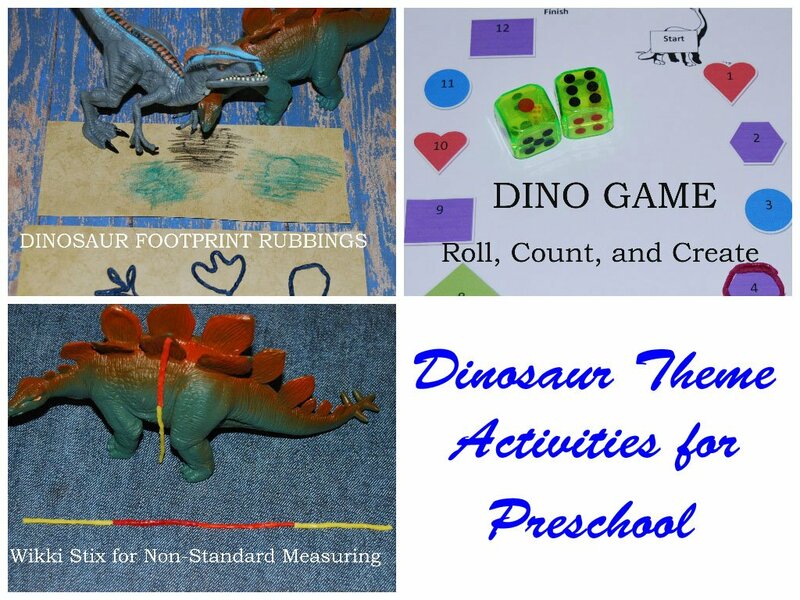 It’s a fun fine motor craft to do a dinosaur theme. Help your children ROAR into a summer of playful learning with Wikki Stix and Dinosaurs! The skills they garner will last long after the activities are over! 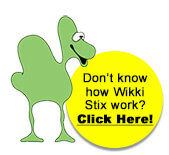 You might also like the Wikki Stix Dinosaur Fun Kit!